The Crawford Notch Campground is located on 100 wooded acres with about one mile of frontage on New Hampshire's Saco River. We are surrounded by 800,000 acres of White Mountain National Forest which is noted for its natural scenic beauty and opportunities for outdoor adventure. We have a unique variety of campsites in the woods and along the river and brooks that run through our property. Types of campsites available include: wooded tent sites, sites for pop up campers and RVs, and rustic log camping cabins. They are spacious, well maintained and offer a secluded feeling among the many trees. Each site has a picnic table and a fire-ring or stone fireplace. Secluded tent sites, beautiful views, great New Hampshire camping location... All combine to make Crawford Notch Campground one of the best tent camping places in New England. Give us a try and we think you will agree. 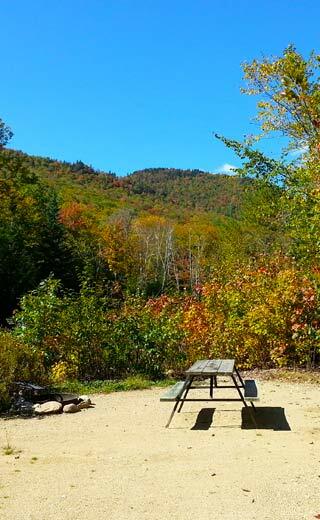 Our campground is also centrally located to most of the popular White Mountains Attractions. If you're looking for a relaxing, peaceful and memorable New Hampshire vacation, look no further than Crawford Notch Campground. Also enjoy browsing our Crawford Notch apparel, camping and hiking gear, gifts and souvenirs. We feature locally made products.